Get all the latest Free Cozy Games bingo site bonuses and Live Bingo Network offers here. Lucky Socks Bingo: 7 Days Of Free Bingo + 20 Extra Spins on Fluffy Favourites! Lucky Socks Bingo is giving all new players 7 Days of Free Bingo on sign up (completely free) and a double money bonus on deposit plus 20 Extra Spins on Fluffy Favourites and a lucky pair of socks! This bingo site will have you thanking your lucky stars as well as your lucky socks! *New players only, 18+, deposit bonus is based on the deposit amount, £10 minimum & £500 maximum deposit, 20 extra spins (7 day expiry) on Fluffy Favourites with minimum deposit of £20, wagering requirements 4x on bingo apply on deposit bonus & 40x on slots apply on winnings from extra spins, T&C’s apply. Bingo Anywhere are greeting all new bingo players with deposit £10 and play with £40 Bingo bonus. Join today and you will be given 7 days of free bingo. Just click on our button below. If you’re one of the many thousands of players who likes to play bingo anywhere, then this mobile bingo site is sure to become your next gaming destination. Discover a huge choice of bingo and slots games, and all in a superb mobile gaming site. If you haven’t had a chance to play at Time Bingo yet, then it’s high time to give it a go! You get 7 days of free bingo games as soon as you sign up. And on top of that, if you deposit £10, you will get £30 extra. That’s £40 to play with! Raise a glass to this fabulous new player bonus with a first deposit bonus of 300%. Your bingo funds won’t fizzle out any time soon with this great free bonus offer! Love My Bingo: Up To £3,000 Bingo in 1st Week! Join our Love My Bingo to play unlimited bingo for 7 days! Sign up and start playing straight away. Love my Bingo is full of colour, warmth and brilliant online bingo entertainment! All players will be settling into some of their favourite games in no time. *18+, new players only, 300% deposit bonus up to £120 on first deposit, 30 days expiry, minimum deposit £5, maximum deposit £500,Bingo Wagering requirements 4x bingo, 20x slots,T&Cs apply. Sign up to Scrummy Bingo, and get up to £3000 free bingo in the first week.A Bingo site Bonus to all new players. There’s a free all you can eat scrummy bingo buffet waiting for every new player at this brilliant and fun filled bingo site. Packed with a spread of exciting games, all bingo fans will be enjoying some very scrummy fun on the house in no time. *18+, new players only, 300% deposit bonus up to £120 on first deposit, 30 days expiry, minimum deposit £5, maximum deposit £500,Wagering requirements 4x bingo, 20x slots,T&Cs apply. Snappy Bingo: Up to £3000 Free Bingo! Sink your teeth into some fun! Snappy Bingo is starting all new players off with a great Welcome offer! Snap up a massive free welcome bonus at this very happy and cheerful online bingo site that’s packed with loads of exciting bingo and slots games. Bingo Reem have a Deposit £10 play with £40 Bingo Bonus waiting for all new players. Plus you can play for free for 7 days at this Cozy Games Site on the Live Bingo Network, so you can enjoy some games on the house! Bingo Date’s Deposit £10 play with £40 Bingo Bonus is open to all new players who register for a new account using our bonus button below! Bingo Date is looking to make a good first impression and their welcome package certainly does that. They’ll get you started with 7 days of free bingo games with no deposit required and then keep you interested with a 300% cash match bonus on your first deposit. Wow Bingo’s Bingo Bonus is giving all new players a generous welcome offer! Get yours by registering for a new player account. There’s a lot to go wow about at this awesome bingo site, and we’re not just talking about the 7 days of free game access with no deposit required. Deposit £10 and you will get a £30 bonus put directly into your account! Sweet Home Bingo: Deposit £10 Play With £40! Sweet Home Bingo site are making it easy for all Bingo Site players to get playing with a deposit £10, play with £40 bonus. Sweet Home Bingo is adding a spoonful of sugar to all bingo player’s appetites with a delightfully sugar-tastic gaming site that’s got bingo, slots and a whole lot more. You’ll be sugar rushing in no time! Bingo Bytes is on the Live Bingo Network and like all sites on this network you can expect to find plenty of exciting bingo games, slots and very generous new player bonuses. Bingo G: Get £30 Bingo Bonus Here! BingoG is a Cozy Games bingo site that’s giving every lucky new player a 300% Welcome Bingo Bonus, plus free bingo games and cheap bingo tickets. Bingo G offers a full selection of exciting bingo games and over 35 mini games and slots that can be enjoyed for free or for cash! Get started here with a Deposit £10, Play with £40 Bonus when you sign up! Goldfish Bingo have a tip top 300% Deposit Bonus waiting for every new player who signs up! Goldfish Bingo is yet another great Cozy Games bingo site with a whole heap of goodies waiting for every player. To start with, there’s a 300% matching bonus with your name on! Read our review below and if you like what you see, sign up and start playing for free. Bingo Hero: Get £30 Bingo Bonus! Bingo Hero is an adventurous SuperPower bingo site and they’re making it easy for all new players to have fun with their Welcome Bingo Bonus. Let’s all give a heroes welcome to Bingo Hero, a flawless bingo site with more then enough exciting bingo games and jackpots for everyone! All you have to do is sign up using the link below to receive 7 days of free bingo, no deposit required. And when you make your first deposit of £10, they’ll add an extra £30 to your account! Buttercup Bingo: Deposit £10 & Play with a £30 Bingo Bonus! Buttercup bingo is a Cozy Games Bingo Site with a top £30 Bingo Bonus that’s available to all players when you deposit £10 on sign up! This Cozy Games bingo site is part of the Live Bingo Network and has over 35 exciting games to play. If you’re after a good few hours of fun and good times, Buttercup Bingo is a brilliant place to play. Kelly’s Eye Bingo are welcoming all new bingo players through the door with a fabulous Welcome Bonus. Check out this new Cozy Games Bingo site for free! Kelly’s bingo has been built by a team of professionals who know what it takes to deliver a flawless user experience that’s filled with fun, excitement, and everybody’s favourite, big wins! Bingo Crazy is a Cozy Partners Bingo site with a fantastic and crazy welcome bonus for all players on sign up! All you need to do is register and you will be presented with 7 days of free bingo games with no deposit required! You will also receive a 300% first deposit bonus which can be claimed up to £120. Bingo Crazy is a crazy new bingo site with a plethora of exciting bingo games and energy fuelled slots. Grab your bag of loot because Swag Bingo site is giving you the chance to claim a £30 Bingo Bonus! Swag Bingo is inviting new players to try out the site with style. Play bingo slots and games with a £10 deposit and get £30 bingo bonus! Click our bingo bonus below for your chance of a life changing swag bag! *18+, new players, 300% equal bingo bonus up to £120 on first deposit, 30 days expiry, £5 minimum deposit & £500 maximum deposit,wagering requirements 4x bingo, 20x slots, T&Cs apply. 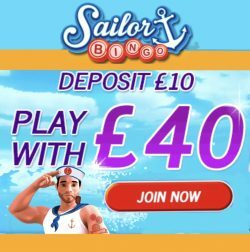 Sail away within Sailor Bingo’s new players offer! If you deposit just £10, you will get £30 free. That’s £40 credit to play with. On top of that, you instantly receive access to the Newbie Room for a whole week of free bingo worth up to £3,000! Click here, to join now! Budget Bingo: Deposit £10 Play with £40! Budget Bingo are giving all new players a great offer of £40 to play with, when you deposit £10 on sign up! Thats a bargain! If you love bingo and you’re playing on a budget, Budget Bingo is the one for you. It is jam packed with bonuses and there’s lots of free bingo for you to benefit from! Just for signing up and depositing £10 you’ll get a 300% Bonus which will give you an extra £30 to play with! Bingo Chimp: Deposit £10, Play with £40! Bingo Chimp is a fun bingo site with a fantastic welcome Bonus. So join us on the Jungle Trail and sign up for a new account to claim yours, it’s that simple! We all like a bit of monkeying around from time to time and so does Bingo Chimp, one of the newest bingo site releases of 2016! This Cozy Games enthused site is fully stocked with great games and fabulous new player bonuses. Sola Bingo UK: Deposit £10 Play with £40! Deposit £10 & Play with £40! And get up to £3000 free bingo in first week!Simply sign up to start your cosmic adventure at Sola Bingo. The sun is always shinning at this bright and colourful bingo site. With a great line up of player favourite bingo games and slots! Landmark Bingo new sign ups get to play with £40 when they deposit £10! This entertainment filled bingo site has gone for a unique theming idea that’s fresh and fun! Take a quick read of our bingo review to find out more. Epic Bingo: Up To £3000 free bingo in first week! Epic Bingo are a new Cozy Games bingo site with up to £3000 free bingo in your first week! Register for a new account to start playing. Get your £30 Deposit bonus by depositing £10 and play with £40! Epic Bingo has got a big name but does their bingo site live up to the expectations? There’s all the great bingo classics, a large selection of slots and, most importantly, they deliver a safe, secure and fun gaming environment that all players can have fun with! *18+, new players only, 300% match bingo bonus up to £120 on first deposit, 30 days expiry, minimum deposit £5, maximum deposit £500,Wagering requirements 4x bingo, 20x slots,T&Cs apply. Free! Up to £3000 Free Bingo in your first week for all new players at the Viking Winners Bingo. Pick up this Free Bingo Welcome offer by simply signing up! Don’t worry, speaking Norse is not required, these friendly Vikings are bang up to date. 90, 80 and 75 ball bingo games are available and try the exciting slots ‘The Hunt’ and ‘Cupids Arrow’. Bingo1: Free Bingo for 1 week + 100% Match & 20 Free Spins! At Bingo1, they are proud to offer you the chance to try before you buy with a whole week of completely Free Bingo. That’s right, register today and you can play for free for 7 days!The Bingo Site: Bingo1 is offering £10 Free Deposit Bonus to all new players, deposit £10 play with £20. Plus 20 free spins is yours as an extra bonus. This brand new bingo site has joined the Live Bingo Network. Sign up and use your free £10 big bingo bonus amount to take a look around. Bigheart Bingo are giving new players a £40 bingo site bonus to play with on deposit. Register for a new account using our bonus button to get yours! Bigheart Bingo bring together a brilliant selection of over 35 games in a safe, secure and very exciting bingo gaming platform that gives a percentage of their proceeds to charity!